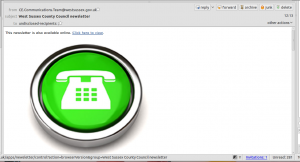 A particularly odd newsletter from West Sussex County Council this week. Delivered via email, it looks like this in Mozilla Thunderbird. 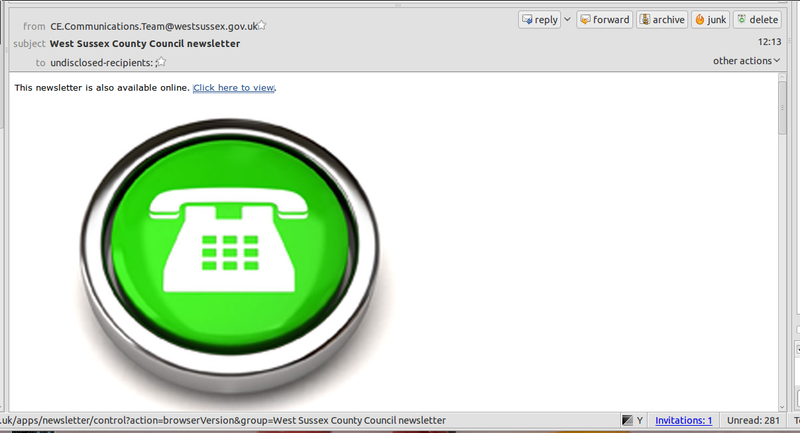 Why is the council sending me a giant green button with a telephone in it? I genuinely have no idea. I think its something to do with the first story, which has been bumped off the page. This talks about supporting victims of hate crime and ends with a phone number. But there’s no suggestion that this is a story specifically about this phoneline. The rest of the newsletter has lots of nice, smiling happy imagery of people enjoying council services. Why not lead on one of those?